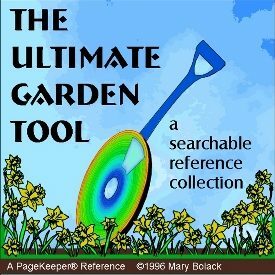 The Ultimate Garden Tool, searchable gardening reference software. View and print our product brochure. What IS the Ultimate Garden Tool? How do I use it? View the more extensive README FILE from the reference. Take a walk through The Ultimate Garden Tool. I'd like to order The Ultimate Garden Tool. I have a document that I'd like to contribute to the next edition. Find out how you can get Electric Mulch Ltd. to build a customized document database from your materials. Our favorite cool and useful websites for you to visit. to see about our role-playing game publications and web page design services. Copyright 1996, 1997, Electric Mulch, Ltd. All rights reserved. This page has been accessed times since November 1.